1. While operating in mtns anchors are required to fix rope, preparation of bases for rappelling, stream crossing and belaying. Proper selection and placement of anchors is a critical skill that requires a great deal of practice. 2 Anchors are of two types ie natural and artificial anchor. (a) Trees. Trees are probably the most widely used of all natural anchors. However, trees must be carefully checked for suitability. (b) Boulders. Boulders and rock nubbins make ideal anchors. The rock can be firmly tapped with a piton hammer to ensure it is solid. Sedimentary and other loose rock formations are not stable. (c) Chockstones. A chockstone is a rock that is wedged in a crack because the crack narrows downward . Chockstones should be checked for strength, security, and crumbling and should always be tested before use. All chockstones must be solid and strong enough to support the load. 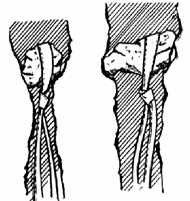 They must have maximum surface contact and be well tapered with the surrounding rock to remain in position. (d) Rock Projections. Rock projections often make suitable anchor. These include blocks, flakes, horns, and spikes. If rock projections are used, their firmness is important. They should be checked for cracks, sharp edges or weathering that may impair their firmness. If any of these signs exist, the projection should be avoided. (e) Bushes and Shrubs. 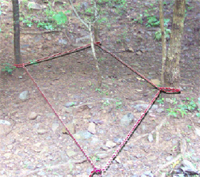 If no other suitable anchor is available, the roots of bushes can be used by routing a rope around the bases of several bushes. 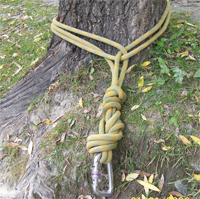 As with trees, the anchoring rope is placed as low as possible to reduce leverage on the anchor. All vegetation should be healthy and well rooted to the ground. 4. 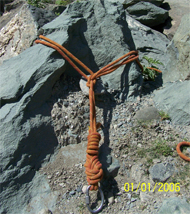 Using artificial anchors become necessary when natural anchors are unavailable. The art of choosing and placing good anchors require a great deal of practice and experience. Artificial anchors are available in many different types such as pitons, chocks, hexcentrics, and Spring Loaded Camming Devices. Anchor strength varies greatly; the type used depends on the terrain, equipment, and the load to be placed on it. (a) Deadman. A “deadman” anchor is any solid object buried in the ground and used as an anchor. (b) Pitons. Pitons can be hammered in rock cracks to work as anchor. Stability of the piton in a rock crack has to be tested before using this anchor for any purpose. (c) Chock Nuts and Spring loaded Camming Device(SLCD). 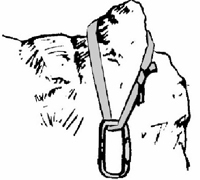 Chock nuts and SLCD can be placed in the cracks on the rock face to use them as anchors. Depending upon the size of the crack, chock nut or SLCD of appropriate size can be used. 5. Application of different types of anchors in rope system and climbing helps in maintaining the momentum of mountain climbers.